Although powerful and flexible, the method of generalized linear models (GLM) is limited in its ability to accurately deal with longitudinal and clustered data. Developed specifically to accommodate these data types, the method of Generalized Estimating Equations (GEE) extends the GLM algorithm to accommodate the correlated data encountered in health research, social science, biology, and other related fields. 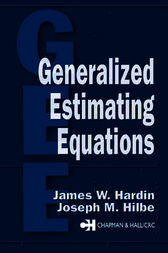 Generalized Estimating Equations provides the first complete treatment of GEE methodology in all of its variations. After introducing the subject and reviewing GLM, the authors examine the different varieties of generalized estimating equations and compare them with other methods, such as fixed and random effects models. The treatment then moves to residual analysis and goodness of fit, demonstrating many of the graphical and statistical techniques applicable to GEE analysis. With its careful balance of origins, applications, relationships, and interpretation, this book offers a unique opportunity to gain a full understanding of GEE methods, from their foundations to their implementation. While equally valuable to theorists, it includes the mathematical and algorithmic detail researchers need to put GEE into practice.